The most finicky and difficult of the cole (cabbage family) crops to grow, cauliflower flourishes when temperatures are moderate. Purple (left), orange and yellow-green colored varieties make good addition to flower gardens. Can tolerate light shade but will slow maturity. Light shade can be beneficial in warm weather. Prefers well-drained, fertile soil high in organic matter, pH 6.0 to 7.5. Can tolerate slightly alkaline soil. Needs plentiful, consistent moisture. In addition to tying heads to blanch white-headed varieties, cauliflower requires good soil, timely planting and protection from pests. Some varieties have white stems and veins. frost - Mature heads will not tolerate hard freezes. not native to North America - Not known in the wild. Descended from wild Mediterranean kale. Most finicky of the cole (cabbage family) crops. Heads will not develop properly in hot or dry weather, so timing is crucial. Will tolerate cold as well as other cole crops in spring, but mature heads are not resistant to hard freezes. Sow seeds indoors 4 to 6 weeks before average last spring frost. Keep soil warm (about 75 F), until germination. Then keep plants around 60 F. Provide direct sun so plants don’t get leggy. When plants are 4 to 6 weeks old, transplant into garden 15 to 24 inches apart in rows 24 to 36 inches apart. Wait until soil temperature is 50 F or above and danger of frost is past before transplanting. Larger, older transplants are more likely to bolt when exposed to cool temperatures in the garden. Transplant when plants have four or five true leaves. Some cultivars will form small “button” heads when the weather turns warm following a 10-day stretch when high temperatures only reach the 40s F.
Direct seeding is more difficult than with other cole crops, especially in spring. For fall crops, plant seed in late-spring early summer � to � inch deep, about 3 inches apart. Thin to final spacings. Or start transplants in late May and transplant in late June or early July. Plants have shallow root systems. Avoid even shallow cultivation. Mulch to protect roots, reduce weed competition and conserve moisture. To preserve the white color of the curd, use string or rubber bands to secure outside leaves over the head when it is about 2 to 3 inches in diameter. From tying to harvest may take less than a week in summer or as long as a month in fall. Too much sun, heat or nitrogen fertilizer can cause “ricey” heads where the curd separates into small, rice-like grains. Cabbageworms - Handpick and destroy. Row covers may be useful on small plantings to help protect plants from early damage. Put in place at planting and remove before temperatures get too hot in midsummer. Flea beetles - Use row covers to help protect plants from early damage. Put in place at planting and remove before temperatures get too hot in midsummer. Control weeds. Cabbage root maggot - White maggots (larvae) attack all plants of the cabbage family. Larvae tunnel in and feed on roots of plants. Damage causes wilting early on, death of plants a little later on. Cabbage aphids - A hard stream of water can be used to remove aphids from plants. Wash off with water occasionally as needed early in the day. Check for evidence of natural enemies such as gray-brown or bloated parasitized aphids and the presence of alligator-like larvae of lady beetles and lacewings. Purple blotch (Alternaria porri) - Avoid wetting foliage if possible. Water early in the day so aboveground plant parts dry as quickly as possible. Avoid crowding around plants; space apart to allow air circulation. Eliminate weeds around plants and garden area to improve circulation. Practive sanitation: when plants are not wet, carefully remove and destroy affected plant parts. In autumn, rake and dispose of all fallen or discarded leaves and fruit. Browse cauliflower varieties at our Vegetable Varieties for Gardeners website. Chose several maturity dates for extended harvest. Some varieties have leaves that cover the head, making it less critical to tie leaves around the head to blanch. Purple-, orange- and yellow-green-headed varieties don’t need tying. Orange heads high in beta-carotene. Look for varieties that are cold- and/or heat-tolerant. Heat-tolerant varieties are usually more easily damaged by frost when mature, so they are not good choices for fall crops. Those that are cold-tolerant usually don’t make good spring crops, because they are less likely to stand up to heat when they mature. 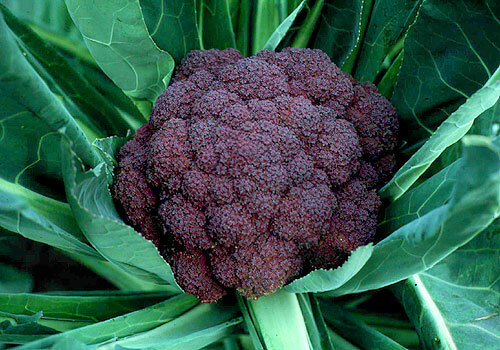 “Broccoflowers” are a broccoli/cauliflower cross.